We meet Joe Kidd when he is locked up for poaching on Native American land in the small town of Sinola, New Mexico, on a spring day in 1902, ten years before New Mexico would become the 47th state admitted to the U.S. A former bounty hunter, Joe remains neutral when he is invited to join a landowner’s posse tracking down the Mexican bandito Luis Chama (John Saxon), but he is eventually convinced to join after one of Chama’s attacks hits closer to home. Having changed out of the tweed suit he was wearing in town, Joe Kidd dresses for his days on the trail tracking Luis Chama. A departure from the iconic “Man with No Name” image that Eastwood had cultivated across a trio of Italian-made films in the mid-1960s, Joe Kidd’s hunting attire is simple, practical, and surprisingly timeless save for one or two details. Joe wears a thigh-length hunting jacket in brown wool fleece, though it more resembles a fuzzy angora sweater than the synthetic “performance fleece” that have enjoyed modern popularity thanks to brands like Eddie Bauer and Old Navy. The ventless, five-button jacket jacket is accented in brown leather, from the large Ulster-style collar and “turnback” cuffs to the jetting on the straight hip pockets. Under the open collar of his shirt, Joe wears a plain black silk neckerchief that was auctioned and sold for just under $600 in December 2011. 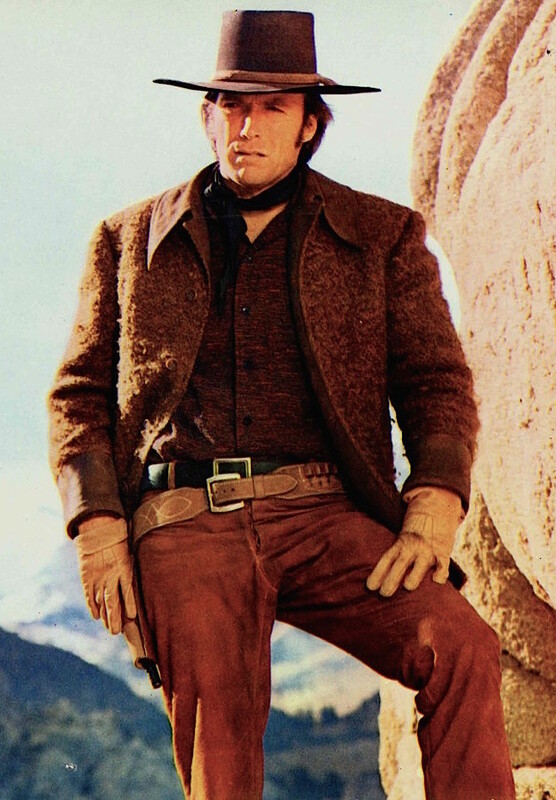 Eastwood’s friend, stuntman John “Bear” Hudkins, had gifted the screen-worn neckerchief to Andrew Yochem for his help with the horses on the set of Joe Kidd, and it was the Yochem Estate who subsequently offered the piece for auction. The extra-long disco collar is a little more 1972 than 1902, but we’ll give Joe a pass here. Joe wears a dark maroon melange flannel shirt with black sew-through buttons down the plain front and a single button closing each cuff. Underneath, he wears a beige henley-style undershirt that occasionally pokes out of the bare triangle between his maroon shirt and the kerchief around his neck. 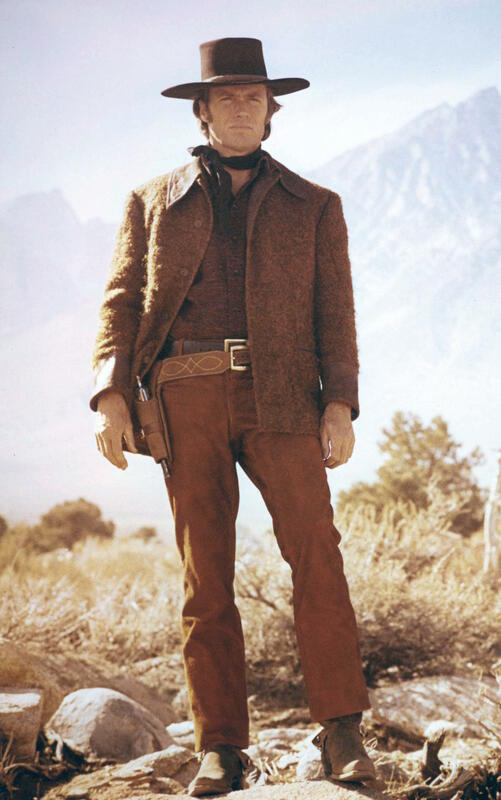 Assuming that the maroon shirt is a woolen flannel, the undershirt provides a comfortable layer between Eastwood’s skin and the itchy woolen shirting. Joe gleefully reacquaints himself with his returned revolver. Joe’s burnt orange needlecord flat front pants have belt loops, side pockets, and two patch pockets in the back. This medium-dark shade between orange and brown was very popular during the 1970s and still shows up frequently in sports and school colors, such as by Auburn University, Oklahoma State University, University of Texas at Austin, the Chicago Bears, the Cleveland Browns, and the San Jose Sharks. His wide, smooth black leather belt with its squared steel single-prong buckle coordinates with his black neckerchief, while his tan tooled leather gun belt with its cartridge loops and Single Action Army holster better echo the leather of his boots. Joe’s dark brown napped leather riding boots have silver Western spurs around the heels with leather straps buckled over the vamps. Another piece of Joe Kidd’s wardrobe that has been sold at auction is his dark brown Stetson hat in 3X beaver, purchased from Nudie’s Rodeo Tailors in North Hollywood. Joe also has a pair of tan leather three-point work gloves that keep his hands protected for dangerous work like sniper standoffs with Olin Mingo (James Wainwright), one of Frank Harlan’s henchmen. Joe Kidd’s sidearm is a Single Action Army revolver with a 7.5″ barrel. The Single Action Army design was developed for U.S. military trials in the early 1870s by Colt engineers William Mason and Charles Brinckerhoff Richards. The “New Model Army Metallic Cartridge Revolving Pistol” began production in 1873 and the legendary “Peacemaker” would gain a prominent place in American history and pop culture as “The Gun That Won the West”, alongside the venerated Winchester rifle. The powerful .45 Colt (or .45 Long Colt) black powder cartridge was developed for the Colt Single Action Army, though the revolver was offered for many handgun and rifle rounds from .32-20 Winchester (WCF) and .38-40 WCF up to .41 Colt and .44-40 WCF. The Cavalry-issued Single Action Army with its long, 7.5″ barrel became the standard, though other popular models would quickly become available with 5.5″ barrels, 4.75″ barrels, and even some “compact” revolvers with barrels less than four inches long. Call in the cavalry: Joe Kidd carries a Single Action Army with a 7.5″ barrel. Despite the fact that it wasn’t Joe’s primary weapon, the Mauser C96 being effectively – almost over-effectively – handled by Clint Eastwood has become a lasting image from Joe Kidd. An early semi-automatic pistol that was developed for the German military, the “Broomhandle” Mauser is an unlikely contender for a starring role in an American Western. As its designation implies, the Mauser C96 was first produced in 1896 and was fielded by armed forces in Germany, China, Italy, and the Ottoman Empire within a decade. The unique-looking weapon’s popularity extended to the British Empire, where it was privately purchased by officers like a young Winston Churchill and T.E. Lawrence. Thus, it’s reasonable that the Mauser pistol would end up in the hands of a New Mexico mercenary like Lamarr Simms (Don Stroud) by the spring of 1902, providing a contrast to the abundance of single-action revolvers and lever-action rifles associated with scenes in the Old West. As written in the IMFDB description, Lamarr “fits the unique holster/stock combo to the back of the grip to shoulder the pistol like a rifle.” After he steals the Mauser and uses it during his escape from Harlan’s posse, Joe handles it the same way, though the weapon fires about 30 rounds before the ten-round magazine actually needs to be reloaded. The 7.63x25mm Mauser pistol would later be the basis of Han Solo‘s blaster in the Star Wars series. While some may have considered the Mauser C96 to be anachronistic, the weapon’s production timeline actually meant it was considerably appropriate for the film’s 1902 setting. (The bottomless magazine, however, is certainly an error.) The Ross rifle that Joe uses during his escape from the bounty hunters, however, is a slight anachronism. The straight-pull bolt-action Ross rifle was developed for Canadian service following a dispute between Canada and the United Kingdom regarding licensing of the venerable British Lee-Enfield rifle for Canadian forces during the Second Boer War. Sir Charles Ross, a Scottish entrepreneur and sharpshooter, offered to finance the factory to make the rifles and thus lent his name to the weapon’s appellation. Based on the design of the Austrian Mannlicher M1895 rifle, which had refined Ferdinand Ritter von Mannlicher’s innovative straight-pull action bolt, the Ross Mark I rolled off the production line in 1903, just a year after Joe Kidd was set. It was followed two years later by the Ross Mark II, which proved to be capable for target shooting but ultimately unsuitable for the rigors of trench warfare that Canadian soldiers faced during World War I. The .303 British cartridge was the original round for Ross rifles, though the company began testing with alternate cartridges as early as the Ross Model 1903 Sporter when some rare examples were offered in .256 Mannlicher and .370 Express. F.W. Jones developed the medium-game .280 Ross rimless cartridge in November 1906 for Ross Rifle Company for its sporting rifles, and the Mark III was expressly designed in 1910 for the new .280 Ross. In Joe Kidd, Joe steals a custom sporterized Ross Mark III (Ross Model 1910) rifle from the bounty hunters’ collection. The Wollensak 4x scope and micrometer mount, identified by IMFDB, help Joe during his sniper standoff with Mingo. After decades of the all-American Winchester lever-action rifle ruling the West, it’s quite a difference to see a Clint Eastwood shouldering a Canadian-made rifle developed after a dispute with the English over a war in South Africa. The film’s 1902 setting is only provided by looking closely at screen props like Luis Chama’s wanted poster and the 45 stars on the Sinola County Courthouse flag; the actual setting could ostensibly be anytime before 1907, thus making the Ross Model 1910 rifle slightly less of an anachronism. Joe Kidd is notable among Westerns for its unique selection of weapons not often seen in the genre, aided both by the slightly more modern setting of pre-statehood New Mexico Territory and also writer Elmore Leonard’s wish to include lesser-seen firearms. Joe Kidd wears an appropriately ochre-toned ensemble for his adventure in the mountains, blending a quintessentially Western aesthetic with timeless practicality. Lamarr, I got a dollar here says I can break your neck before you get that rig moved a half inch.